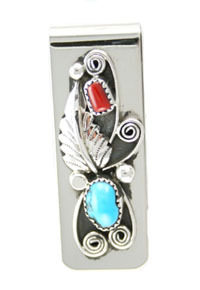 This money clip is crafted with a free form sleeping beauty turquoise and coral stone, a sterling silver leaf and vines on a nickle money clip. It measures approximately 2 1/8" long by 3/4" wide. Crafted by Navajo artisan Wilbur and Elsie Myers Stone shape and size will vary.